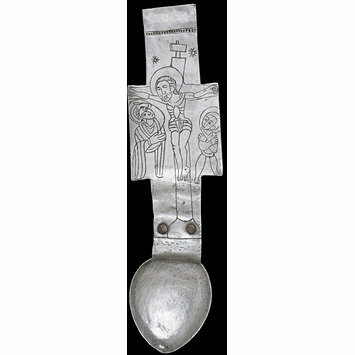 This sacramental spoon comes from the Ethiopian Orthodox church and was used to serve the consecrated wine. It is engraved with the Crucifixion flanked by the Virgin Mary and St John. The Ethiopian church was part of the Coptic church until 1959, when it became fully independent. 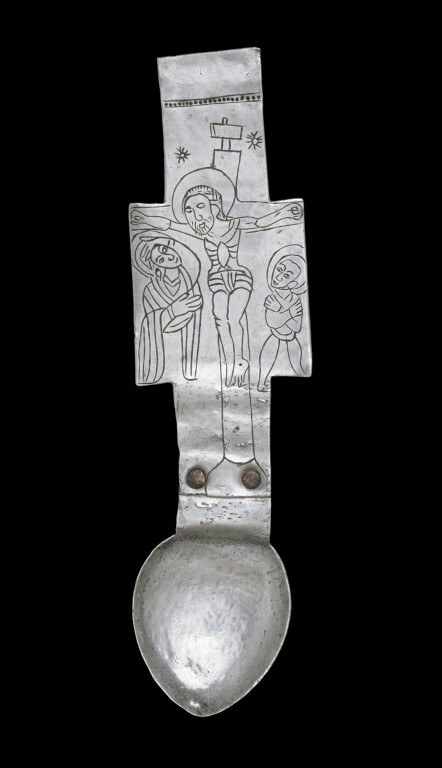 Sacramental spoon, the handle cruciform and engraved with Christ on the cross and to his right his mother Mary and to his left St John the apostle. Purchased from Mr W.H. Saunders for £1.00. Received November 5th 1868. The history of the church around and beyond the eastern Mediterranean is complex. The earliest eastern churches were established in Antioch, Alexandria and other cities in the 1st century. They were independent communities and theological controversy sharpened their differences. In 330 Constantinople (now Istanbul) became the capital of the Roman empire. Successive bishops of Constantinople, later given the title of patriarch, gradually won authority over other eastern churches, despite the opposition of the pope. Churches that accepted the jurisdiction of the patriarch became known as Orthodox, but others, including those of Armenia and Ethiopia, developed along separate lines. Diversity of practice and doctrine in the eastern churches is reflected in the different kinds of regalia and sacred silver. Yet some forms such as the chalice are common to all, indicating a shared core of beliefs.